Becoming a host for a parasitic dragon wasn't part of the plan. Actually, there wasn’t really any plan to begin with, but when the dragon egg hatches, Ashe figures it's time to come up with one. Katsu's plans are failing miserably. His vast medical knowledge isn't helping Ashe's dragon situation, he's having problems staying detached, and the other mercenaries are concerned about their lifeforce being sucked dry and want Ashe to leave. Katsu is determined that if Ashe leaves, so will he. First, though, he has to make sure that his people aren't killed in battle... something they seem determined to do. 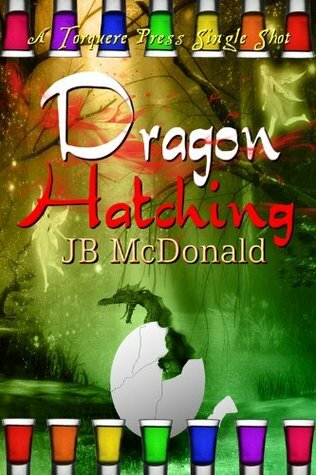 This is the third installment in JB McDonald’s series with Ashe, the mercenary elf who’s not too clear on how to use his magic, and Katsu, the human medic for the mercenary band, who’s far too grumpy to admit he cares about anything besides a successful healing. This time, an elven ritual of redistributing the magic wakens more than Ashe could imagine. A dragon egg he kept in his magpie’s nest of souvenirs and pretty things wasn’t supposed to hatch, but next thing he knows, he’s playing parent to the hatchling, who slurps up the deliciousness of elven magic with a side of life force. Getting rid of this unwelcome freeloader is now his and Katsu’s top priority, until the other mercenaries do what mercenaries do, and there are casualties to treat. The relationship between Katsu and Ashe remains a delight—-Ashe has learned what not to take at face value. What sounds like a chewing-out from Katsu falls like love poetry on his ears, and Katus’s growls about even asking a question have meaning that gladdens Ashe’s heart. Ashe is a sunny sort, not asking much from life except adventure, which he’s gotten in far greater quantities since connecting with Katsu. He’s still pretty independent, and having to rely on Katsu for staying alive and free as keeps happening is still something he’s getting used to. Tha pair have been together for two adventures by now; the story works okay as a standalone, though it’s stronger for reading the other two first. The relationship arc is still in the getting solidified zone, but if the readers are waiting for Katsu to declare love in a way that doesn’t have to be translated from “grouchy”, I think we all may be waiting a long time. His actions speak for him. The issue of the dragon isn’t quite as clear cut: the story ends on an impasse, though the beast turns out to have a few redeeming qualities. Major issues remain, which smells like sequel bait. This and a couple of scenes from the POV of a secondary character who is apparently the designated asker of questions took away from the overall story, but not so much that it isn’t an enjoyable read. I did feel at this point, where I didn’t in the other two, that I hadn’t gotten all my questions answered.